Tough, glossy and featuring full color on both sides! Customized in glistening full color on stainless steel! Polished silver and durable hard enameled colors. 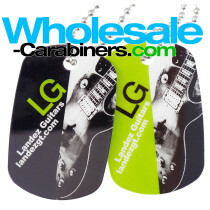 Customized in brushed tones and wholesale priced! Customized in cool antiqued nickel and wholesale priced! As hard as it might be to imagine, there was actually a time when dog tags were used exclusively by military personnel for soldier identification! 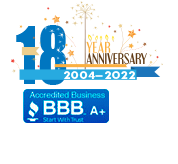 Of course, now these tags are extremely popular for all sorts of purposes, from signifying school achievement, to branding with other products, at sporting and other competitive events, as marketing giveaways at sales functions and trade shows — frankly, the list of uses is vitually endless. Having large areas for customization, featuring vibrant colors, and being very durable, it's easy to see exactly why they fit so perfectly for so many different uses. 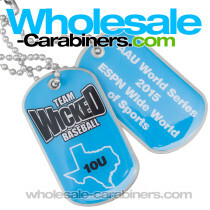 If you are looking for full color graphics, our unique glossy finished, super tough teslin based custom dog tag is the perfect product for you. 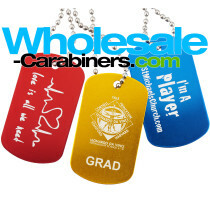 Be as creative as you want: Let your imagination run free in customizing your dog tags -- precise imprinting in CMYK ensures that your graphics "pop" off your tag. 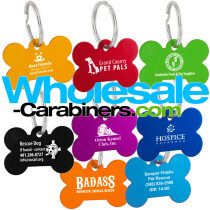 Additionally, you can incorporate pictures / photos as well as mascots, gradients, drop shadows and more on these dog tags, all of course along with clear, crisp text. The text and graphics on our full color dog tags have smooth gradients with fine detailing and feature full edge to edge color coverage. You can make one side one color, and the other a complimentary color, reverse images and so on -- the options are unlimited. 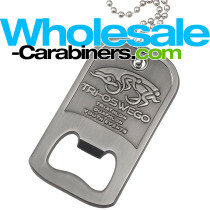 For our classic lasered dog tags, our use of high quality engraving equipment coupled with vibrantly colored, anodized, lead free aluminum results in a classic look in a cool solid metal item. The art you provide will pop in silver/white, against the colored aluminum base material. The lasers are very sharp, and the detail in these items is simply amazing. 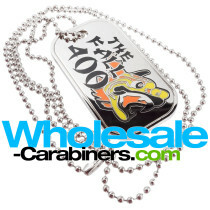 Providing the best value and convenience to our customers, our dog tags come with 30" chains or standard key rings. We also provide silencers, which can be fully assembled at no additional cost. 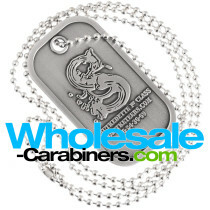 And our engravable dog tags can be engraved on both sides, and the full color option even comes with both sides customized already included in the pricing. 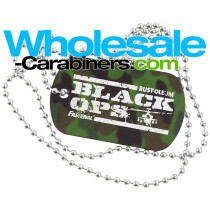 We offer individual packaging option for each dog tag, in protective polybags. 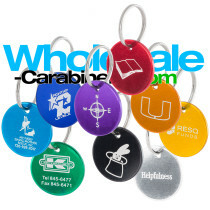 Quality, convenience, and value is our mission at Wholesale-carabiners.com!